Conviction is a virtual necessity of any kind of political cinema especially the one that claims to magnify the ills and sickness of society. Out of the Bengali triumvirate including Ray and Ghatak, Mrinal Sen was by far the most radical, advocating a leftist Naxalite inspired ideology whilst borrowing liberally from European modernists like Godard and Brecht. Unlike the classicist style of Ray and Ghatak’s epic tradition, Sen’s response to the turmoil of contemporary Bengali politics in Calcutta during the 1970s was consolidated in the immediacy of revolutionary ideals and articulated through a distinctive ‘third cinema’ approach. Released in 1972, ‘Calcutta 71’, was the second film in Sen’s Calcutta trilogy and it is generally regarded by critics as one of the greatest achievements of the New Indian cinema movement. Another element separating Sen from both Ray and Ghatak was his anti illusionary mode – sustaining the aesthetics of realism were subordinate to the political content and most importantly, the dissemination of ideas. Like Godard and Eisenstein, Sen stripped away the classical form and traditions of cinema, revelling in a reflexive prism of Brecht inspired agitprop methods. Ray and Ghatak may have certainly laid the foundation for a new, personally engaged cinema but Mrinal Sen was instrumental in outlining a specific doctrine. Such a politically inspired cinematic doctrine was issued in the form of a manifesto by both Sen and Arun Kaul in 1968 arguing for ‘a state sponsored alternative to commercial cinema’. Sen like Ghatak was involved with the Indian People Theatre Association and it is here that he discovered the work of Brecht, realising the possibilities of utilising art as a tool for the propagation of ideas and instigating wider change in society. Ray continues to be judged as an apolitical film maker when compared to both Sen and Ghatak. The problem with this kind of judgement is that any film maker who is placed alongside as Sen is likely to be accused of ideological abandonment. 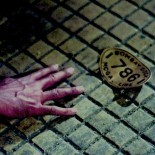 Obviously, the great weakness with a film like ‘Calcutta 71’ is the lack of emotional involvement. Parallel film maker Shyam Benegal argues that Sen’s later work is much more engaging and rounded when compared to his seventies films which he says left him cold. Of course, much of this criticism is related to the effects of Brechtian devices which are supposed to frustrate and agitate the spectator to think seriously about the ideas being explored. The film itself becomes more fragmented as we get nearer to the turbulent seventies and this reflected in the use of montage – Sen acknowledging the influence of Eisenstein. It is in the final episode in which Sen cuts between a group of middle class intellectuals and the young radical who is being chased by the establishment that the film most resembles the Godardian impulse of the late sixties. 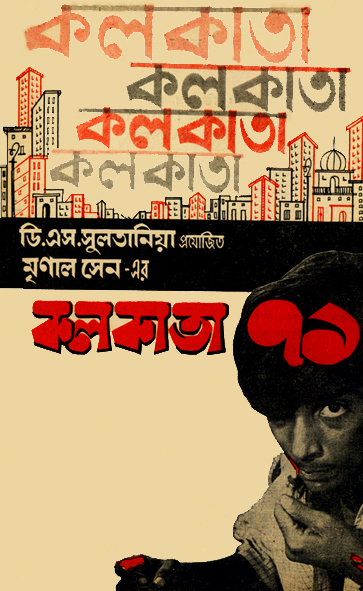 1971 saw the release of both Sen and Ray’s first films in what would be parallel trilogies on the social and political crisis facing the middle classes of Calcutta in the seventies and much of the ideological debate was filtered through an emerging, disillusioned Bengali youth. Ray’s political anger may have remained in check for a long time but with ‘Pratidwandi’ (The Adversary) he silenced many of his critics by choosing to endorse Sen’s notion that it was the collective responsibility of cinema to respond, inform and agitate the audience. Personally, Ray’s ‘Calcutta trilogy’ is a far greater achievement than Sen’s three films and though ‘Seemabaddha’ (Company Limited, 71) is the weak link, it is ‘Jana Aranya’ (The Middleman, 75) that proves to be one of the strongest and most sophisticated Indian films of this era. MS: I made CALCUTTA-71 when Calcutta was passing through a terrible time. People were getting killed every day. The most militant faction of the Communist Party—the Naxalites—had rejected all forms of parliamentary politics. At the same time they had a host of differences with the other two Communist Party factions. These, in turn, led to many interparty clashes. Invariably all of the factions ignored the main issue of mobilizing forces against the vested interests—the establishment. This was the time when I felt I should spell out the basic ills of the country, the fundamental diseases we are suffering from and the humiliations we have been subject to. This was the time to talk of poverty—the most vital reality of our country, the basic factor in the indignity of our people. I wanted to interpret the restlessness, the turbulence of the period that is 1971 and what it is due to. I wanted to have a genesis. The anger has not suddenly fallen out of anywhere. It must have a beginning and an end. I wanted to try to find this genesis and in the process redefine our history. And in my mind this is extremely political. I found a continuing link in the film—a young man of 20, uncorrupted. He has lived this age of 20 for the last 1000 years or more. He has been passing through death and squalor and poverty. And for the past 1000 years or more he has bridged despair and frustration. For him the history of India is a continuous history not of synthesis but of poverty and exploitation. The natural and historically continuous co existence between poverty and exploitation was not the story of Calcutta in the 70s, it extended from a ‘third cinema’ perspective outlined by Fernando Solanas and Octavio Getino. Thus, one can conclude that a film like ‘Calcutta 71’ shares a much greater affinity with the ‘Cinema Novo’ movement of the 60s whilst a highly politicised film maker like Mrinal Sen was closer to the work of Glauber Rocha who also believed that ‘third cinema’ was the way forward in terms of resisting all forms of hegemony whilst criticising the derisory gap between rich and poor, between the oppressor and the oppressed. Whilst Ray’s cinema was never as fatalistic or disillusioning as that of Ghatak or Mrinal Sen, the greatest achievement of ‘Calcutta 71’ remains in it’s uncompromising political content and how like many of Godard’s films of the late 60s and early 70s it has become somewhat of a very significant historical document and powerful record of the times. This entry was posted on October 20, 2014 by Omar Ahmed in Indian CInema and tagged Auteur Cinema, Bengali cinema, Mrinal Sen, Parallel Cinema, Political Cinema.